Podcast: 80 years since Black Tuesday, is this recession over? WASHINGTON (CNN) - In the latest installment of CNN=Politics Daily: After the longest economic slump since the Great Depression, the White House claims that the economy has rebounded - ironically on the 80th anniversary of Black Tuesday. CNN's White House Correspondent Ed Henry has the details. Plus: House Speaker Nancy Pelosi unveiled a 2,000 page bill combining three different versions of health care legislation passed by the House committees. CNN's Senior Congressional Correspondent Dana Bash reports on why Democratic leaders are applauding this milestone. Finally: Three candidates are battling for a congressional seat in a remote area of New York. CNN's Mary Snow investigates what the outcome will mean for the GOP. WASHINGTON (CNN) - President Barack Obama will host Turkish Prime Minister Recep Tayyip Erdogan at a White House meeting on December 7, the White House announced Thursday. Obama and Erdogan will discuss implementing a "shared strategy" for Afghanistan and Pakistan, increasing economic and security cooperation with Iraq, Middle East peace efforts, normalizing relations with Armenia and other issues, a White House news release said. 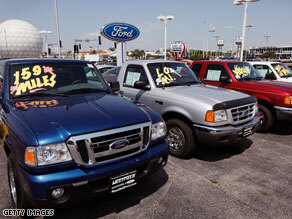 White House fights back on Cash for Clunkers. NEW YORK (CNNMoney.com) - The Obama administration on Thursday lashed out at a prominent critic of its Cash for Clunkers program, arguing that the popular trade-in initiative helped give the auto industry and the economy a much needed boost in the past few months. In a blog post on whitehouse.gov, the administration argued that a report on Clunkers by automotive Web site Edmunds.com "doesn't withstand even basic scrutiny" and is based on "implausible assumptions." On Wednesday, Edmunds.com released a study that argued Cash for Clunkers did not have a great impact on the auto industry. The report said that 690,000 new vehicles were sold under the program last summer, but that only 125,000 of them would not have been sold without the Clunkers rebates. As a result, the report said, the administration's economic claims for the program "have been rendered quite weak." WASHINGTON (CNN) - Democratic Rep. Edward Markey, chairman of the House Select Committee on Energy Independence and Global Warming, grilled witnesses Thursday on what he called "fraudulent letters" sent to Congress on energy and climate legislation before a crucial House vote on the issue. The select committee said on it's Web site that its members and staff discovered more than a dozen fraudulent letters sent to members of Congress by the consulting company Bonner & Associates, on behalf of the American Coalition for Clean Coal Electricity (ACCCE), that claimed electricity rates would rise under a House bill. On its Web site, ACCCE describes itself as a partnership of industries involved in producing electricity from coal. According to the select committee's Web site, the legislation would have "minimal costs" to consumers. The U.S. Environmental Protection Agency "found the overall impact on the average household would be 22 to 30 cents per day ($80 to $111 per year) - or less than the cost of a postage stamp a day," the committee Web site says. The legislation in question, co-sponsored by Markey, ultimately passed the House on June 26 - but in a close vote of 219 to 212. The legislation, which says it aims to "create clean energy jobs, achieve energy independence, reduce global warming pollution and transition to a clean energy economy," is now before the U.S. Senate. At the hearing, Markey and Rep. Jay Inslee, D-Washington, focused their criticism on Steve Miller, president and CEO of ACCCE, and Bonner & Associates. 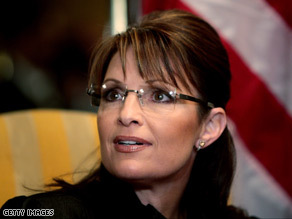 The Democratic National Committee is taking fresh aim at Sarah Palin. (CNN) - The Democratic National Committee is taking fresh aim at Sarah Palin, encouraging supporters to attack the former Alaska governor on Facebook in order to "debunk her lies." In an e-mail to supporters, and on a new Web site, the DNC asks supporters to call out Palin when she uses Facebook to transmit what the committee says are falsehoods. "The more we push back with the truth, the more Sarah Palin and others like her will have to think twice before they promote lies, and the less they'll be able to derail progress," DNC executive director Jen O'Malley Dillon wrote in the e-email. Palin is the latest high-profile Republican to be targeted by the DNC in a campaign they've labeled "call 'em out." Other Republicans in the DNC's cross-hairs have included House Minority Leader John Boehner, Republican National Committee Chairman Michael Steele, and Minnesota Rep. Michele Bachmann. WASHINGTON (CNN) - Two U.S. senators on Thursday confirmed a bipartisan deal intended to extend the first-time homebuyers' tax credit that was originally passed earlier this year as part of the economic stimulus bill. Democratic Sen. Christopher Dodd of Connecticut and Republican Sen. Johnny Isakson of Georgia told a news conference the plan would help the U.S. housing market at a time of decreased home values that have contributed to the economic recession. The original credit in the stimulus bill is set to expire at the end of November and offers a tax credit of $8,000 to first-time homebuyers. Under the agreement announced by Dodd and Isakson, proposed legislation that must pass both chambers of Congress and then be signed by President Barack Obama would extend that $8,000 credit for first-time buyers until the end of next April. In addition, the measure would add a separate $6,500 credit for some current homeowners who buy a new residence by then. 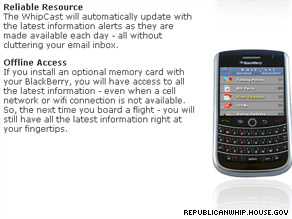 'WhipCast' is a new BlackBerry application launched Thursday by the Office of the House Republican Whip. Washington (CNN) – A new BlackBerry application released Thursday by the office of House Minority Whip Eric Cantor is the latest technology upgrade for Republicans. The new "WhipCast" application is "designed to directly communicate with users in real-time," Cantor's office said in an e-mail. "Today's launch of the WhipCast BlackBerry app is the latest demonstration of our commitment to modernize the way we communicate with Americans from coast-to-coast," Cantor said in an accompanying statement. The new application - which was tested by Cantor's new media team before its public rollout - will deliver text, audio, image and video updates to users, according to Cantor's office. "WhipCast" also gives users access to Republican talking points, policy discussions, polling information, and floor schedule updates. Former Florida Gov. 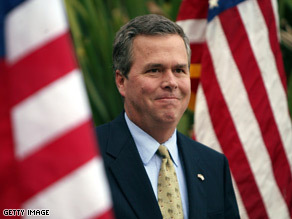 Jeb Bush spoke in Washington on Wednesday. WASHINGTON (CNN) - Since his brother left office in January, former Florida Gov. Jeb Bush has been mostly diplomatic when discussing the Obama administration. On Wednesday, he took a sharper tone. During remarks to a U.S. Chamber of Commerce legal summit in Washington, Bush had tough words for the president in response to an audience question. 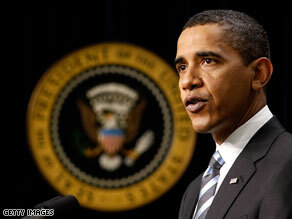 "I think President Obama has used the bully pulpit as a way to attack capitalism," he said, according to LegalNewsline.com. Bush paused a moment, then acknowledged: "That'll make the news." 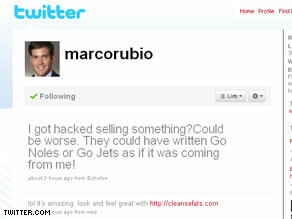 Marco Rubio's Twitter account, which was hacked today. Washington (CNN) - Two prominent Republicans had their Twitter accounts hacked on Wednesday. Florida Senate candidate Marco Rubio and Tennessee gubernatorial candidate Zach Wamp both fell victim to a "phishing attack" that urged their followers to visit a site hawking colon cleansing pills. Meanwhile, Wamp's Twitter account sent out "direct messages," which are not seen publicly but sent directly to followers. His message read: "hi. this works. i feel better and look great. 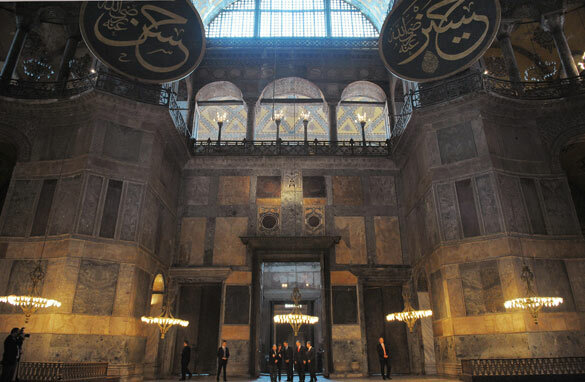 http://bdgdfij.info." That link also re-directed readers to a site selling colon cleansing pills. According to technology consultant Jon-David Schlough, a phishing attack is a type of hack "where an attacker masquerades as a trusted brand or person and fools the user into clicking. Once the user clicks, the attacker may take over their profile and spread the attack to their friends as well - or do other unfriendly things." Rubio campaign spokesperson Alex Burgos told CNN that the candidate quickly changed his password. Wamp's campaign is still investigating what happened, but sent out a message on Twitter telling followers to disregard the direct message.